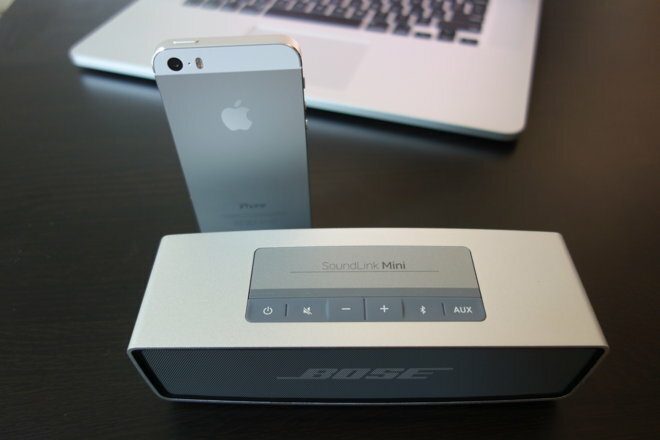 Bose's SoundLink Mini in its charging cradle. Our verdict: If you're in the market for a palm-sized Bluetooth speaker and don't mind spending $200, buy the SoundLink Mini. Choosing speakers has never been an easy task; over the last century, thousands of manufacturers have produced a nearly endless array of options. Any given store might carry a subset of models numbering in the hundreds, forcing even the most seasoned shopper into decision paralysis. Most of us know the feeling of spending hours in our local big-box electronics retailer, dutifully switching between dozens of speakers by pressing little plastic buttons on a shelf, sending electrons surging through 16-gauge wires to power the field magnet, move the voice coil, and vibrate the cardboard or fiberglass or kevlar cone to produce sound. Trying, desperately, to find some hum or buzz or muddy bassline that we could latch onto in an effort to discern one from another before anyone noticed we were listening to Oops!... I Did It Again at an unacceptable volume. Fortunately, that painful process is largely gone, replaced instead by a thorough scouring of Amazon reviews and Reddit recommendations to find the best-sounding set. But now we have a whole new world to contend with: speakers with wireless stuff bolted onto them. In the beginning, Bluetooth speakers had a very specific purpose: amping up the volume of a portable music player while camping, barbecuing, or hanging at the beach. Larger, stationary audio systems handled those duties at home. Lately, however, a shift is on. Bluetooth speakers have become constant companions as people downsize from suburban houses to smaller city-center apartments; the recent trend toward living more simply means eschewing multiple devices where one will do. Manufacturers have followed this progression, designing portable speakers to perform more capably indoors, where quality is more important than volume. Some now come with optional charging docks, and others with built-in microphones to double as smartphone-connected speakerphones. 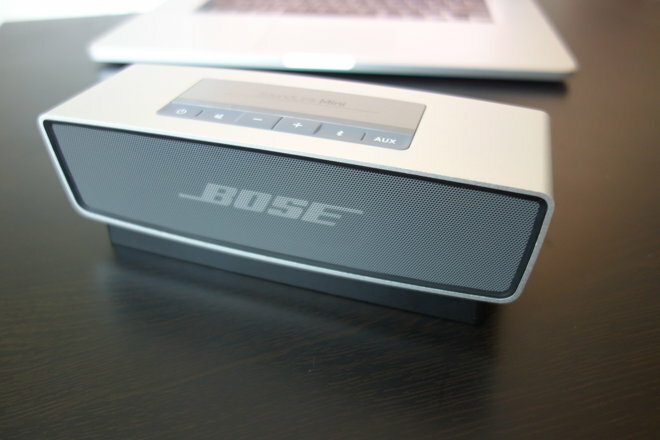 Bose is perhaps the biggest beneficiary of this change. Though the revered QuietComfort line of noise-canceling headphones deserves credit for pulling the brand out of the doldrums, its portable audio systems have quickly put Bose back on top. Of the 10 best-selling Bluetooth speakers on Amazon, only two cost more than $45: Bose's SoundLink Mini and SoundLink Color, which come in at $199 and $129, respectively. There's a reason for that. AppleInsider has spent a month with the $199 SoundLink Mini, using it as our primary in-home audio source. For reference, we tested the device in a modestly-sized one-bedroom flat just above street level in central Hong Kong. There's only one word to describe the SoundLink Mini: solid. Its aluminum casing gives the unit a distinctly premium feel, and the weight is substantial; not too heavy, but noticeably heftier than competitors like Jawbone's Mini Jambox or the Beats Pill. Thankfully, Bose has graced the SoundLink Mini with an understated, dignified industrial design that will blend in to all but the most bohemian decor. It's not unlike a Volvo sedan— it won't win any awards for styling, but it's not embarrassing to be seen with. Truthfully, we don't really like the buttons— they aren't necessarily bad, they just don't feel right. They're a bit fiddly, and rubber makes it seem as though they were intended for a water-resistant device, which the SoundLink Mini is not. Around the right side is a standard 3.5mm headphone jack used for connecting devices directly to the speaker, flanked by a power port that takes input from a small "wall wart"-style plug. The plug comes with American prongs built in, but Bose includes a number of country-specific adapters in the box, a welcome touch. The left side of the unit is blank, while the fore and aft faces are covered in a fine metallic mesh with the Bose logo screen printed on the front. The bottom sports a micro USB port for firmware updates as well as a small pressure connector for charging the SoundLink Mini via the included dock. A single rubber "foot" serves to both stabilize the device and cover up the 2,230 mAh battery, which is designed to be replaceable. The SoundLink Mini's rubber foot hides a battery that can be easily replaced when it wears out. Pairing the SoundLink Mini to a Bluetooth audio source is fairly straightforward. Turn the unit on, press the Bluetooth button until it blinks— which indicates it's discoverable— then select it in the Bluetooth settings of your iPhone, iPad, Mac, or other Bluetooth device of choice. The SoundLink Mini will remember up to six Bluetooth devices at a time, though you can add as many as you like; it will simply drop the least-recently connected device from its memory. In our tests, Bluetooth connection time rarely exceeded three seconds. If the last connected device is in range, simply turning the SoundLink Mini on usually results in an almost immediate pairing. You can try to view the gif directly: http://zippy.gfycat.com/LastingRemorsefulHackee.gif. Sound quality is simply astounding for a device of this size, whether connected via Bluetooth or the auxiliary jack. Mids are well-rounded, highs are crisp and detailed, and the bass is punchy, with an extraordinary amount of thump. The SoundLink Mini faithfully reproduces every note of Bob Dylan's harmonica on It's All Over Now, Baby Blue. Jimi Hendrix's guitar in Foxy Lady is just as clear as the drums-from-a-box on Paul Oakenfold's The Harder They Come, which the SoundLink Mini can project to fill a room in convincing fashion. One of our primary use cases for the SoundLink Mini is tethered to our Apple TV as a sort of miniature soundbar for the television. In this job too the SoundLink Mini excels, standing head and shoulders above the built-in speakers on our Samsung LED set and adding a pleasing low end to gunfire or explosions. It's this latter role that reveals the SoundLink Mini's greatest weakness: it doesn't have a remote control. In fairness, this only matters when using the auxiliary port— and none of Bose's competitors in this space have one either —but it's still something we would like to have seen in the box for a $200 device. Battery life is a stated seven hours, a figure we were able to more-or-less match in our tests. This isn't exactly an impressive figure compared to competitors that boast 10 hours or more off the grid, but it's an acceptable number given that sound quality isn't noticeably different without the wall wart. 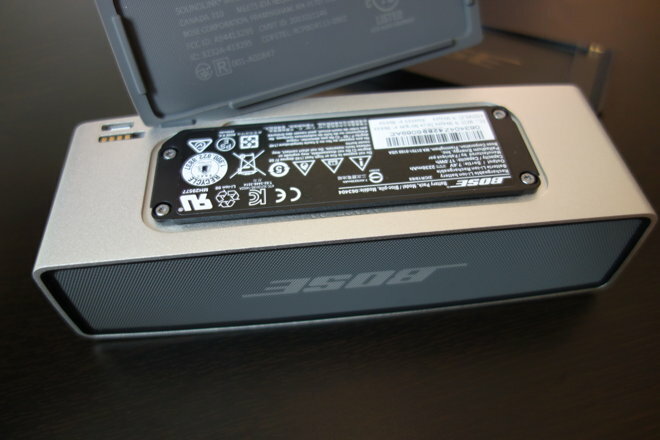 The Bose SoundLink Mini isn't perfect. It's a little heavy, a little expensive, and there's no remote control. It doesn't have a microphone, so it can't be used for calls. It doesn't get as loud as some others, and it's not waterproof. It doesn't matter. 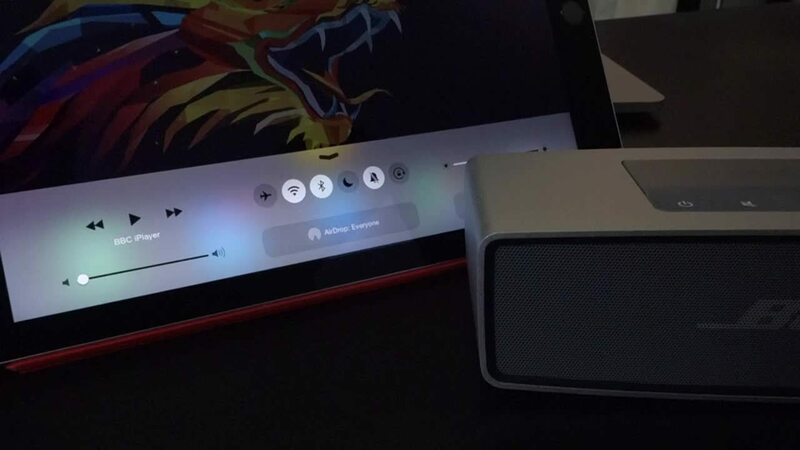 At various points, we've also spent time with Jawbone's Mini Jambox, the Beats Pill, UE's Boom, and JBL's Pulse, and there is simply no other speaker of this size that delivers the kind of full, room-filling sound that the SoundLink Mini is capable of. It may not be the best speaker for every situation, but it's the best one overall. If you're in the market for a palm-sized Bluetooth speaker and don't mind spending $200, buy the SoundLink Mini. The audio is extraordinary for its size. Some will find the $200 price tag excessive. Doesn't have a built-in microphone for use as a speakerphone. 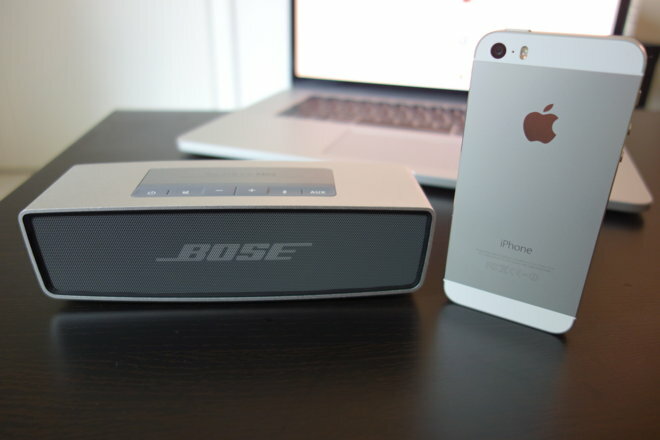 Bose's SoundLink Mini is available for $199 from Apple retail stores and online retailers like Amazon.